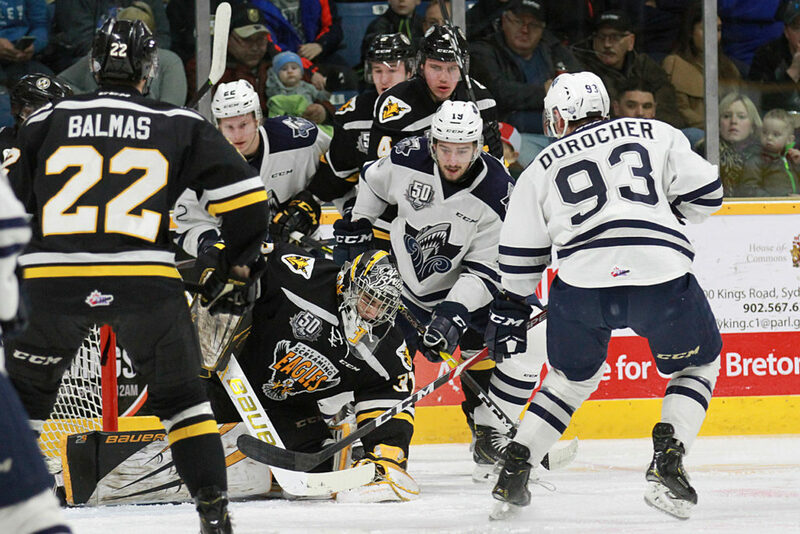 After a day of rest the Cape Breton Screaming Eagles and Rimouski Océanic will resume their best of 7 QMJHL quarter-final series tonight at Centre 200. The Océanic took a 2-1 lead in the series on Tuesday with a 3-0 victory. There are now seven teams in the hunt for the QMJHL’s President’s Cup following the elimination of the Moncton Wildcats by the Halifax Mooseheads last night. Goals have been hard to come by for both teams this series, just ten in total for the two squads combined including two empty netters. Rimouski’s Colten Ellis and Cape Breton’s Kevin Mandolese have not made finding the back of the net easy. Only Rimouski’s Alexis Lafrenière seems to have found the the answer, scoring four goals including at least one in every game of the series. No other player has scored more than once. Both teams changed their forward combinations in game three, by necessity in the Screaming Eagles case. Cape Breton captain Declan Smith missed game 3 with an upper body injury and isn’t expected to play in the remaining home games of the series. Isiah Campbell, making his first appearance of the series, was inserted into his place. Océanic coach Serge Beausolei elected to put physical forward Parker Bowman on the top line along side stars Lafrenière and Jimmy Huntington. It seemed to have the desired affect as Bowman assisted on the winning goal. The Eagles may be wondering what could have had the power play been able to click in game three, especially with Mathias Laferrière hitting the post in the first period as the game may have played out differently had the home side taken the early lead. Cape Breton has won just 1/9 on the man advantage, while Rimouski hasn’t scored at all on power play (0/5).